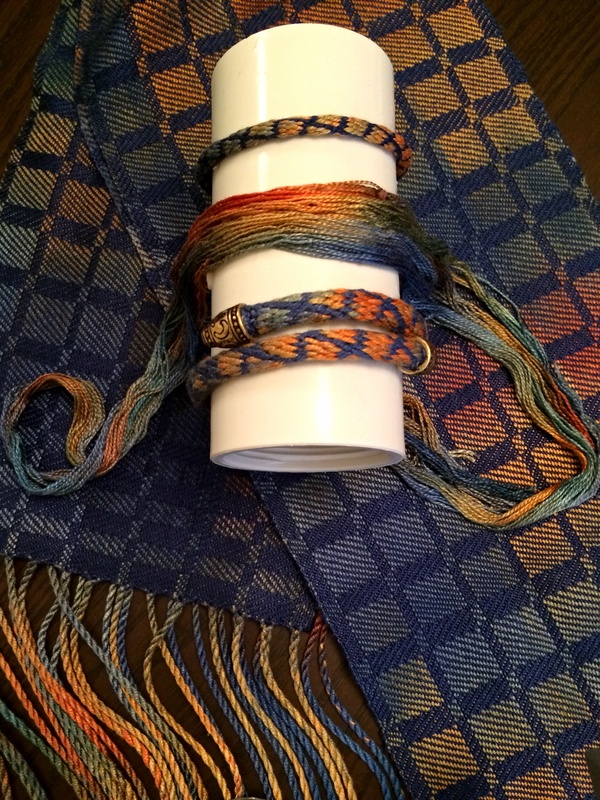 I used dyed silk thrums (loom waste) left over from weaving my turned twill scarf and designed a kumihimo braid that echoed my twill blocks. 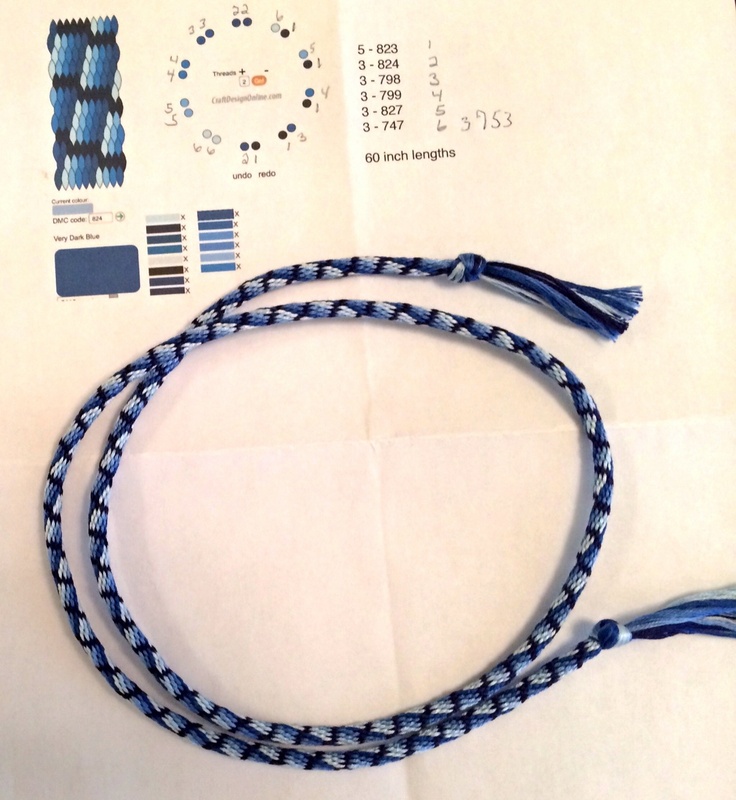 I adapted the kumihimo pattern I showed in Blue. And this is my “pattern”. 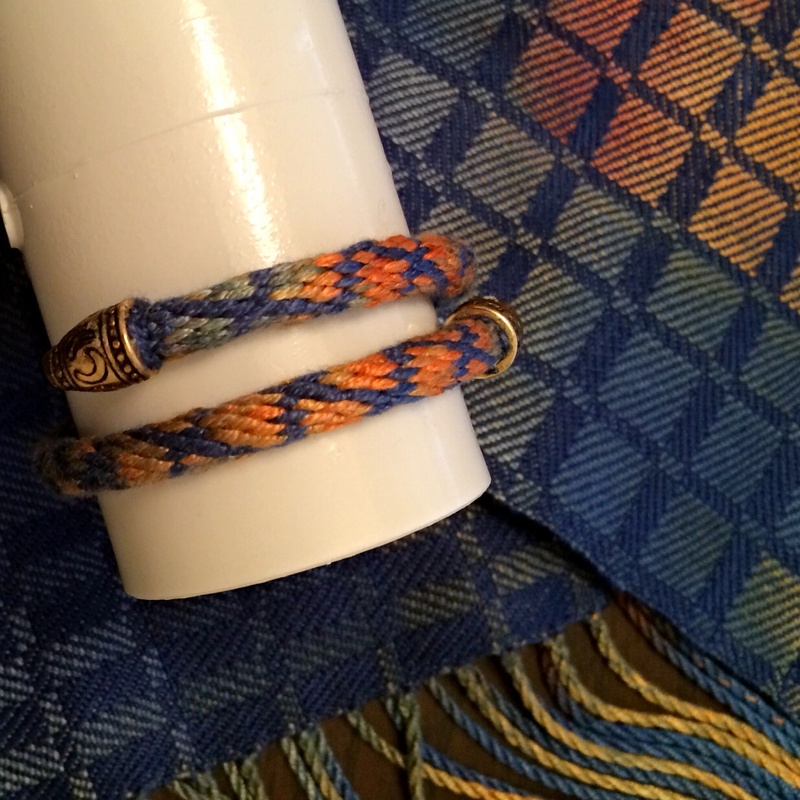 The gold areas on the pattern represent the dyed warp. Note: I used the design tool at craftdesignonline.com to make the adaptation. 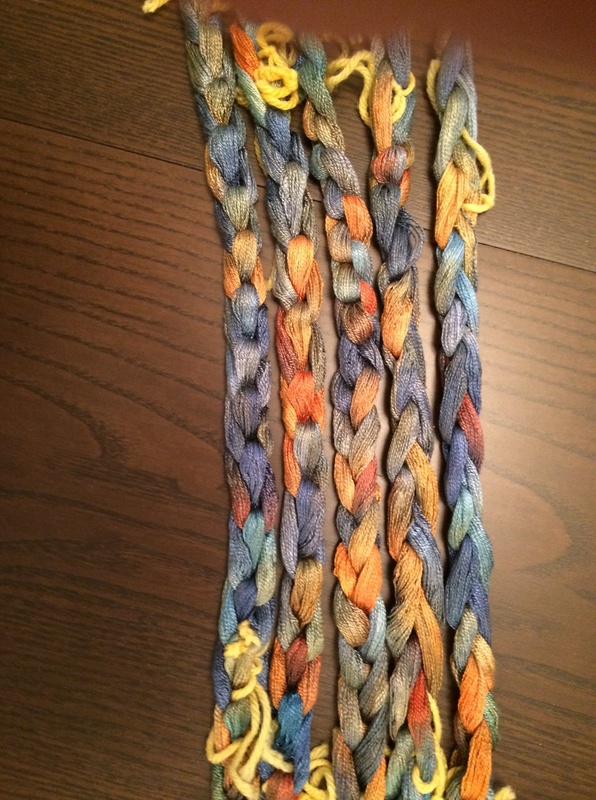 The smaller braid used thrums from the dyed warp and the solid blue used in the scarf (20/2 silk). This is a 20-strand braid and this sample used 2 strands of silk for each slot. I did not use a core and this made a very small braid. 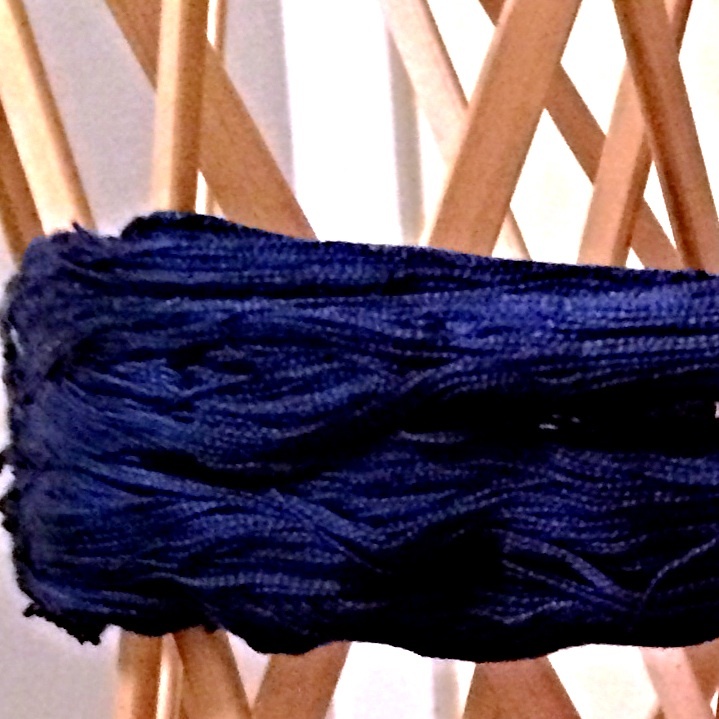 Using the thrums (or loom waste) from my scarf meant my sample was quite short – not enough for 2 wraps around the wrist. 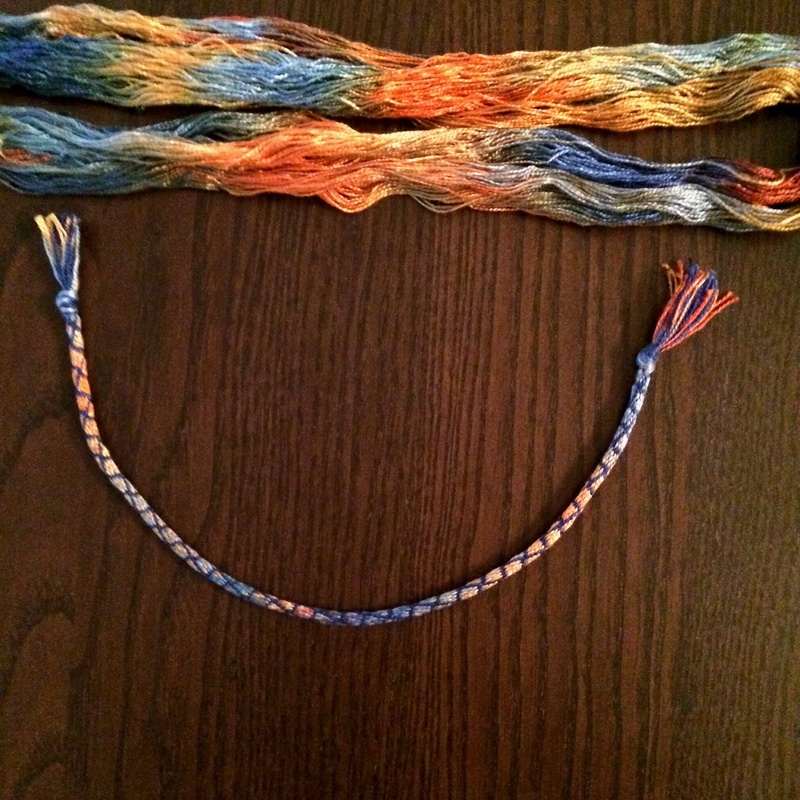 For the second sample, I used the same 20 strand braid, but used 4 strands for each slot. I pulled the wrong solid blue and it was not as dark and intense. I also used memory wire for the core. 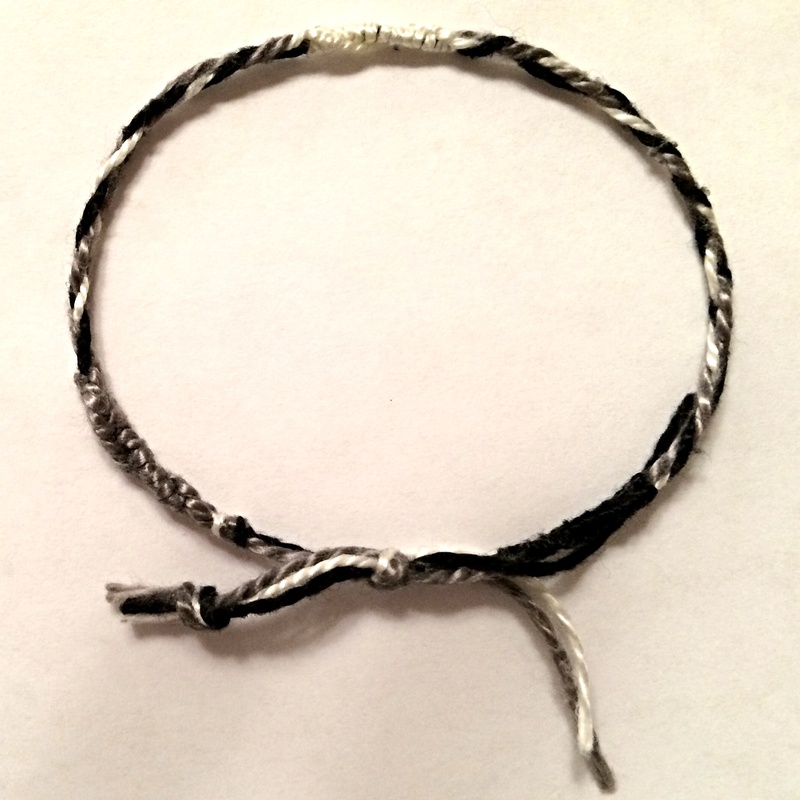 This made a much more robust bracelet, but too short for 2 full wraps. I liked how the design echoed the blocks from the turned twill. I did not like the “finishing”. The first endcap looks slightly better than the second but I was all thumbs as I tried to handle endcap, braid, glue, etc. I have never been a crafter and have little skill, experience, or patience with the fiddly parts. Determined to get some experience by finishing the ends of these samples, I *was* successful in obscuring my fingerprint sufficiently with glue and glue removers so that my fingerprint no longer works on my iphone. I improved slightly on the second endcap in that I did not adhere any body parts. I don’t know if I have enough time and grit left to make up for my crafting illiteracy. I think most people learn to glue MUCH earlier in their life journey. Hmm, wonder if there is a nearby pre-school with space for a large student? Meanwhile, I will braid on, and boldly “finish” every little braid to learn some techniques that work for me. Forgot to blog about the finished scarf! 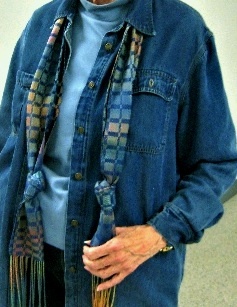 The colors suit my blue jean lifestyle but could work well with a dressier look. I love a turned twill – and it shows off a dyed warp very well. 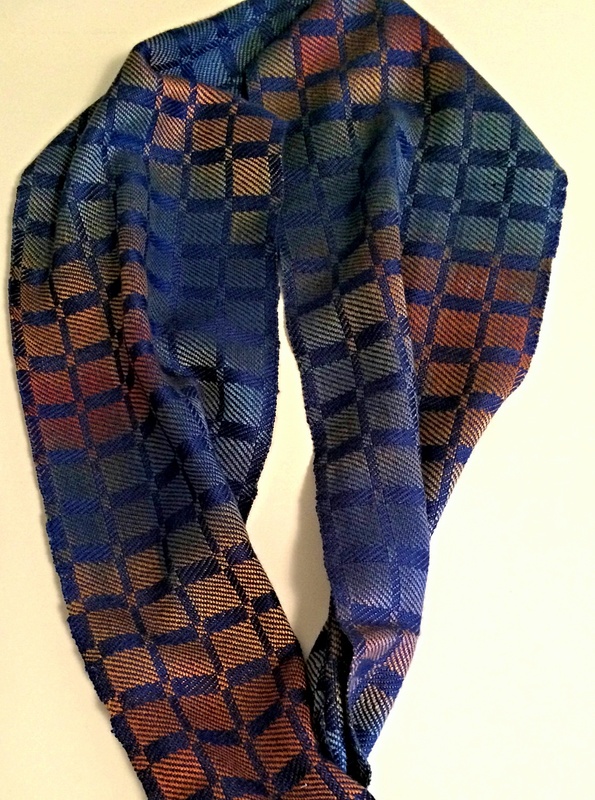 Next post: a kumihimo braid inspired by this scarf. 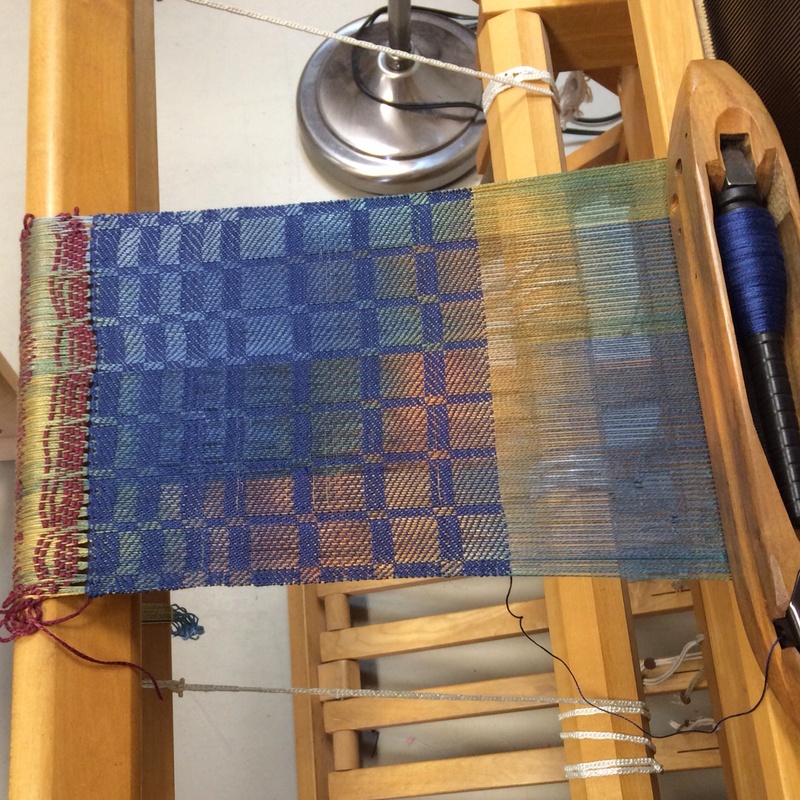 Always interesting to see how the dyed warp interacts with the weave structure. I have had good luck with turned twill in the past and this one is coming along nicely. 20/2 Silk, 24 ends per inch. 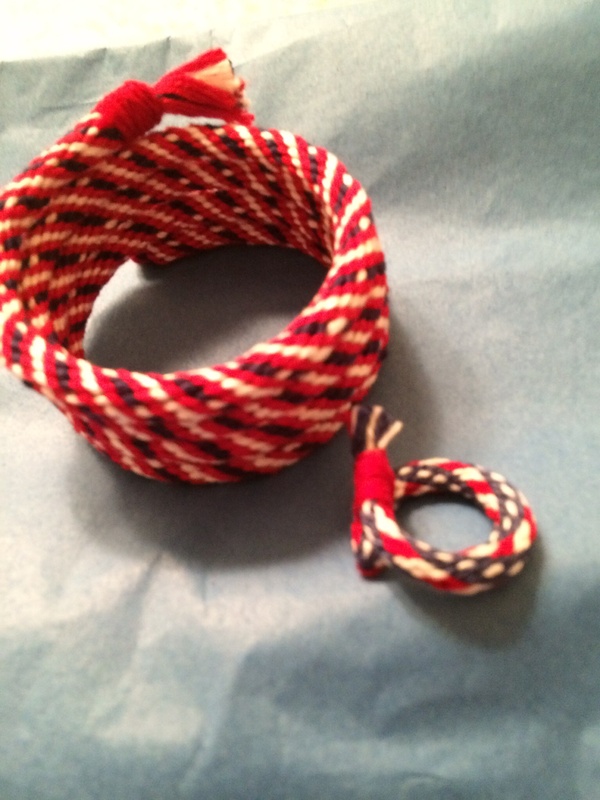 Experimenting with kumihimo patterns and seeing how they relate to the resulting cords is fascinating. I like the round cords and it is difficult for a flat pattern to represent a round finished product for my untrained eye. This braid uses DMC floss. The pattern is from http://friendship-bracelets.net. I think it was shown in red and I used either their generator or the one at http://craftdesignonline.com to modify it with my choice of floss colors. I was attracted to the pattern because of the gradations of color and the 3D effect. In the actual braid I am more aware of the gradations but the 3D effect is obscured because of the round braid. 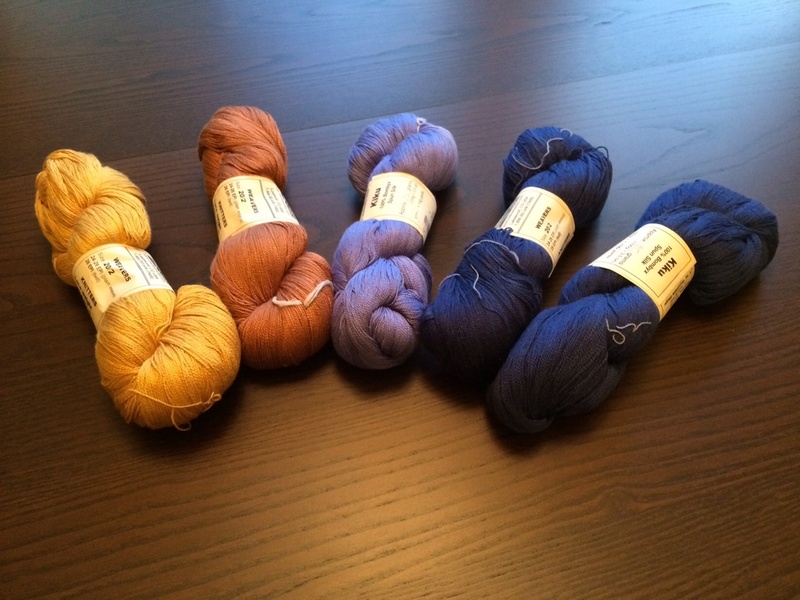 I thought the Navy silk would win out, but an unnamed dark/bright one (4?) is the winner. My class day went great. I’ve always enjoyed Tracy’s classes. She is very organized and knowledgeable. She was able to juggle three varied students efficiently. I am about halfway threaded through the heddles. The real beginner in the group is already weaving! This gal is fast! I will share my draft in the next weaving post. Will try to take some photos of the class too. My Weaving “Refresher” class starts tomorrow. 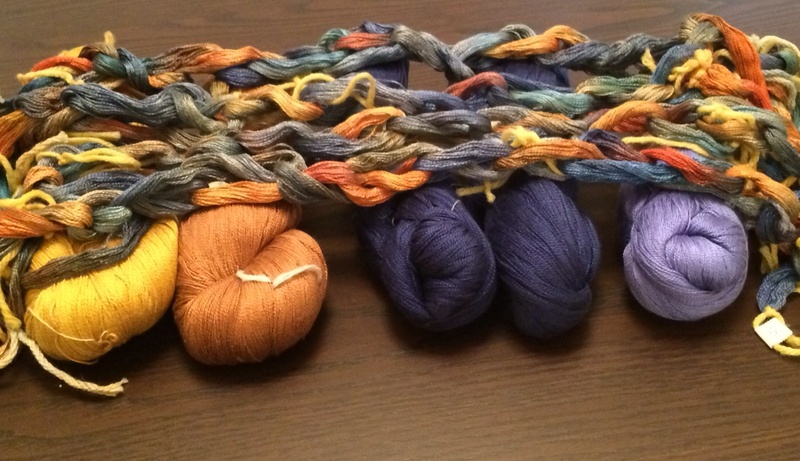 I ordered some Treenway Silks skeins to consider as weft. Of course they are all beautiful colors but the question is which one will work best for my dyed warp. The warp has a kind of faded look and I don’t know which will best enhance it. 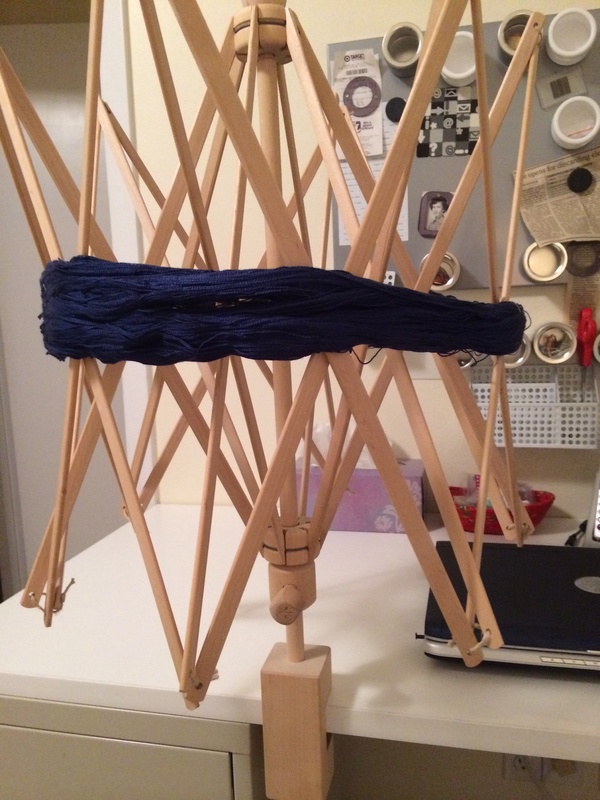 Supposedly a dark color will “frame” the dyed warp. A contrasting color might energize it. The structure is a turned twill. Wanted a boy-like pattern and came across a camouflage design. Used DMC floss for these with rattail for a sliding knot closure. Luckily you do not need camouflage in your hunt for ideas for the bracelets. The search for patterns for these easy little bracelets is as close as your ipad … or whatever device you choose. The page shows the pattern (keeping in mind this is a round braid and the pattern might be mighty small and of course wraps all the way around….) 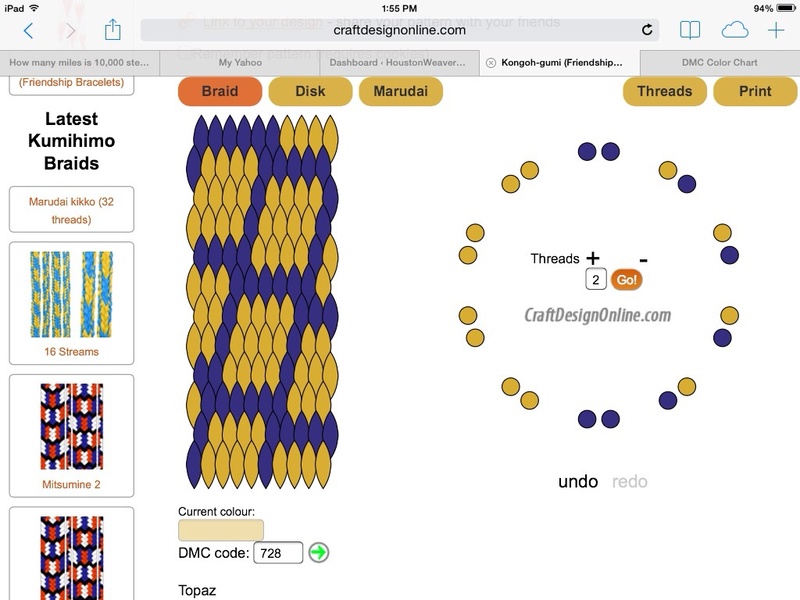 It shows the placement of the threads on the disk and the total number of colors and threads. I usually print this and note on it the colors I use. 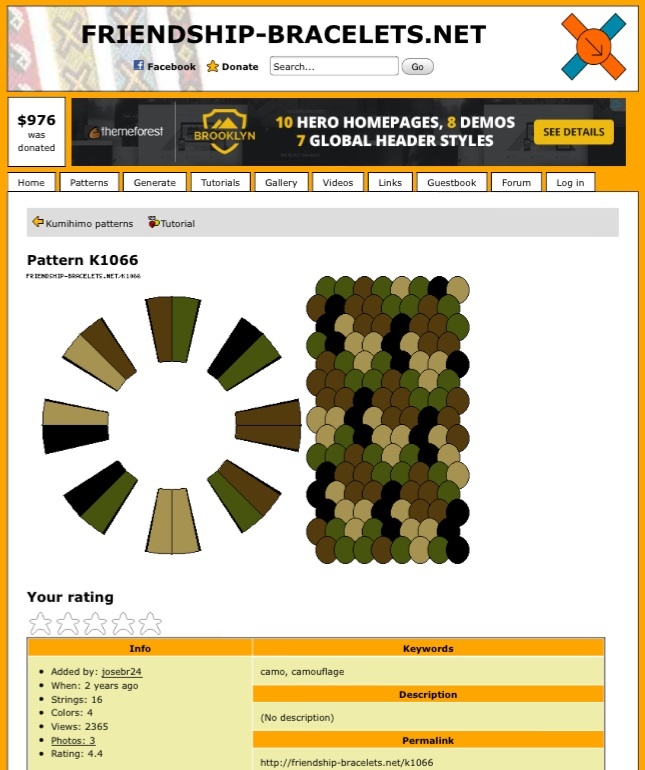 Craft Designs Online is another useful site. 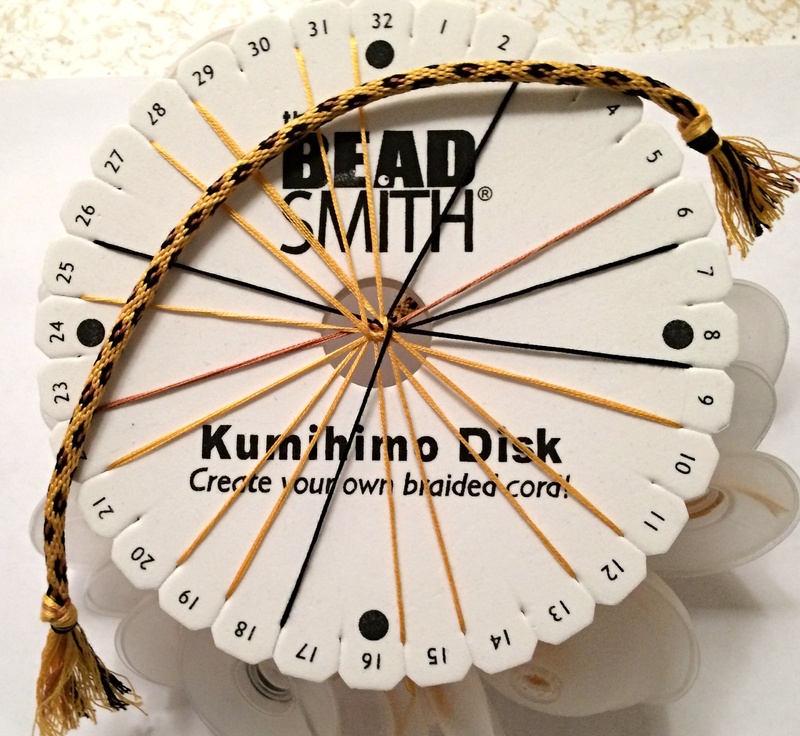 I have used its kumihimo generator to modify a design but the site has many areas I have not yet explored. If you want inspiration, head on over to Pinterest and search on kumihimo. I love that such a simple search will take you to Pins on the topic but with a tab for Boards as well. I haven’t even touched on the beaded kumihimo but your pinterest trip will offer plenty of eye candy for that. Using beads creates new color opportunities because your bead placement can drive your pattern instead of being locked into the progression that thread colors and braiding dictates. Thanks for coming along on my journey through this craft. My weaving starts in August. I really don’t think I yet have an appropriate weft. More on that in an upcoming post. My first stab at braiding these little bracelets started with July 4th. 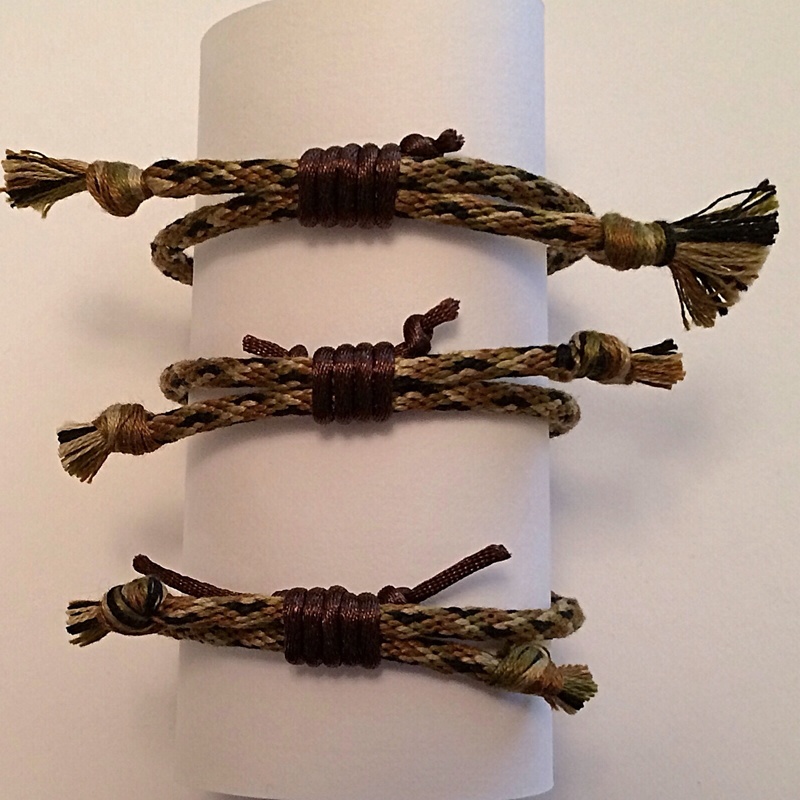 I thought what better way to celebrate than to send some little bracelets to the boys – and their older sister. These are pretty rough, especially the closures – but you’ve gotta start somewhere…. Along with a little ring. I knew she had some activity in full red, white and blue regalia coming up…. I am not crafty at all. Weaving is one of the few crafts to ever catch my attention. But just lately I have spent some time creating braids on a braiding disc. Yes, I know that is called kumihimo, but what I do is much less lofty than that word indicates. But why would I make friendship bracelets. My motivator? Some young relatives. On a visit, one of them gifted me with this charming bracelet. I love how he achieved the solid areas of black, gray and white – and with only those 3 strands! This is a silk warp that my sister dyed over a decade ago. My challenge is to find a compatible weft and to weave a scarf out of it. The warp really reads “blue” to the eye even though it does not in this image. I have ordered 6 different colors to test for the weft. None of them look right to me. The warp has a kind of faded denim base look and the selected potential weft yarns look too vibrant and saturated. So weaving challenge #1 is what weft will I choose and will it work with the warp? Luckily, you can never have too much silk…. This is the site for Houstonweaver. If you are seeking the website for Contemporary Handweavers of Houston, the weaving organization that serves the greater Houston, TX area, go to http://weavehouston.org.